It’s a fascinating experience watching a mystery when you already know all the twists and turns. You get a terrific sense of how the production is working by observing the reactions of the audience just as much as you observe the play itself. 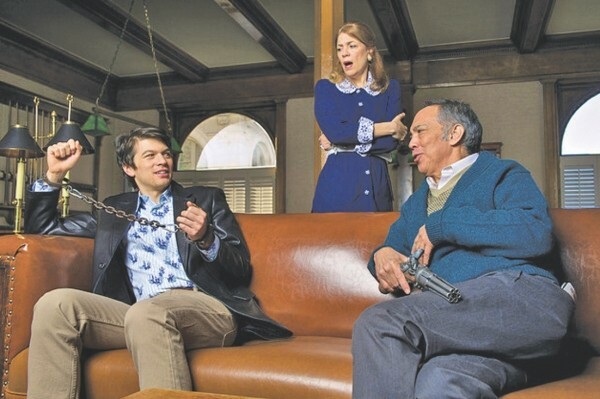 Pioneer Theatre Company’s production of Ira Levin’s 1978 comedic thriller Deathtrap has been around long enough—including a film adaptation—that plenty of its surprises are bound not to be surprises for every viewer. But it’s also far enough from pop-culture ubiquity that new generations can discover afresh the giddy pleasures of this tale about a once-popular playwright named Sidney Bruhl (Thom Sesma) who receives a copy of a promising thriller by Clifford Anderson (Devin Norik), who once took a writing seminar from Sidney. What if, Sidney jokes to his wife, Myra (Gayton Scott), one could steal a sure-fire hit from an unknown writer by killing him? And what if he wasn’t joking? Director May Adrales makes terrific use of Daniel Zimmerman’s grand single-room set design—the walls filled with enough weapons just waiting to be used that Chekhov must be nodding happily in his grave—creating a purely pleasurable contraption of twists and reversals. There’s nothing deeply profound about Levin’s text—aside, perhaps, from its dark pre-reality-TV realization that there’s nothing a has-been won’t stoop to in order to get back to the top—so it’s left to the tight construction and satisfying performances to keep the audience smiling and guessing. And it’s testimony to the effectiveness of this particular production that it works even if a familiarity with the text means you’re not guessing. It’s still easy to appreciate Sesma’s performance, full of acidic line readings and one wordless second-act sequence that provides a wonderful case study of physical acting. It’s still delightful watching Levin play with self-referential jokes about the play-within-the-play, or appreciating a small update that includes name-dropping a cast member from the film version. Or you can simply be an engaged observer in the way viewers react to being surprised—pleasantly or otherwise—by a play that’s smart enough to trap you no matter what you already know, or think you already know.